In the framework of our studies on Greek bee-keeping products (honey, propolis, royal jelly and pollen) and due to an increasing interest in the use of honey as an antioxidant as well as in the treatment of bacterial infections and in traditional Mediterranean diet, we report in this study the chemical analyses, the antimicrobial evaluation and the pollinic spectrum of one honey sample from Greek strawberry-tree (Arbutus unedo L.), which to our best knowledge has never been studied before. Typification of this honey sample, was based on its pollinic spectrum obtained by Louveaux’s quantitative method exerted an approx. 23% Ericaceae pollen. The studied sample was analysed through GC-MS, while metabolites have been also isolated and structurally determined by spectral means. Among the volatile substances: 3,5,5-trimethyl-3-cyclohexen-1-one (β-isophorone), 3,5,5-trimethyl-2-cyclohexen-1-one (α-isophorone) and 3,5,5-trimethylcyclohex-2-ene-1,4-dione (4-oxoisophorone) were detected through GC-MS, as the most characteristic odor constituents1. Moreover, 5-hydroxymethylfurfural (HMF) and homogentistic acid (HGA) have been also determined. HGA is a phenolic metabolite which is responsible for the antioxidant capacity of the strawberry-tree honey itself2, while HMF is a well known, essential parameter of freshness and of good quality of commercial honeys. It is also noteworthy, the isolation of unedone and 2-cis-4-trans-abscisic acid, which according to the international literature are characterized as chemical markers of such European honeys3. Furthermore, the sample exhibited an interesting antimicrobial activity against all assayed human pathogenic microorganisms. 1. Bianchi F., Careri M., Musci M. (2005). Volatile norisoprenoids as markers of botanical origin of Sardinian strawberry tree (Arbutus unedo L.) honey. Characterisation of aroma compounds by dynamic headspace extraction and gas chromatography-mass spectrometry. Food Chemistry 89:527-532. 2. Rosa A., Tuberoso C.I.G., Atzeri A., Melis M.P., Bifulco E., Dessi M.A. (2011). Anti-oxidant profile of strawberry tree honey and its marker homogentistic acid in several models of oxidative stress. Food Chemistry 129:1045-1053. 3. Tuberoso I.G.C., Bifulco E., Caboni P., Cottiglia F., Cabras P., Floris I. (2010). Floral markers of strawberry tree (Arbutus unedo L.) honey. Journal of Agricultural and Food Chemistry 58:384-389. ISNAD ANDREOU, Αrgyrο , CHINOU, Ioanna , GRAIKOU, Konstantia . "Chemical Profile of Greek Arbutus unedo Honey – Biological Properties". 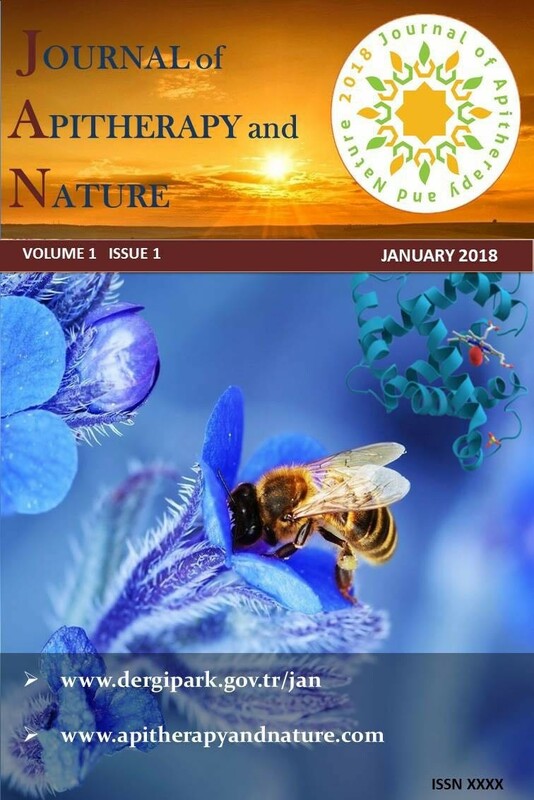 Journal of Apitherapy and Nature 1 / 3 (December 2018): 36-36.